Panasonic has talked up three key camera technologies at its 2007 product presentation this afternoon. These centre around optical image stabilisation (Mega O.I.S), intelligent ISO settings and wide angle photography. 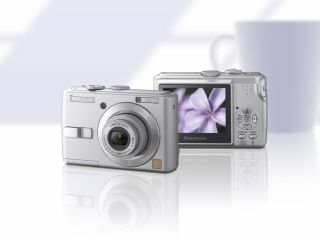 Although the company has included Mega O.I.S in its cameras before, the aim this time has been to include the technology in alll of the cameras in its 2007 model line-up. Mega O.I.S uses technology originally found in camcorders to intelligently reduce camera shake, leading to a huge reduction in camera blur - handy for low-light conditions or where the camera user or the subject is moving around. In the 2007 models, Mega O.I.S. has two modes - mode one physically and continually moves the lens inside the camera to keep your subject sharp; in mode two the lens sits at a central point, but moves quickly to the correct position when the shutter is pressed. Of the two, Panasonic reckons that the second mode - where the lens remains still until the last moment - works best. Mega O.I.S is teamed with Intelligent ISO Control, a feature that automatically adusts the camera's 'film speed' setting so that it is able to capture fast motion while making the most of the available light. This enables the camera to freeze moving images, again with negligible camera blur. The third feature is the use of 28mm wide-angle lens in Panasonic's Lumix cameras. The company says that using a wide-angle Leica lens enables you to include more subjects in a shot than with a normal 35mm lenses - and then demonstrated the fact using a series of tiny figures in front of a model Eiffel tower. The 35mm camera cut off some of the figures and the top of the Eiffel tower, the 28mm camera didn't. Other features Panasonic highlighted include advanced picture noise reduction technology, the ability to take 16:9 images so they can be viewed on widescreen TVs and a huge 80% reduction in power consumption using the company's new Venus Engine 3. Panasonic is also claiming to have eliminate barrel distortion where parallel lines appear to bend in the finished photograph - which can be a problem in pictures of buildings, etc. It also says it has eliminated ghosting in images caused when unwanted light strays into the finished shot. The company says it has been able to achieve this by using a new generation of Leica DC lenses. More specifc info on individual camera models coming up.